For the first time in history, school students can access satellite monitoring technology to play a leading role in halting a major global crisis. Register and become an EarthWatcher now! Earth Watchers is a ground breaking new software tool to enable young people across the planet to monitor the forests and provide usable intelligence to stop deforestation. It provides a new approach for education by actually involving the students directly in the conservation effort by allowing them to monitor real data and to go beyond tokenistic project / lectures to have a hands on impact. Over 75% of deforestation in Indonesia is illegal, and the difficulty in locating and identifying illegal deforestation is a major part of the problem. Through Earth Watchers, young people across the planet can expose the illegal deforestation early, allowing local authorities to step in and halt it. This new transparency and global awareness is made possible by technology developed by Geodan inc from The Netherlands. Each week a new image is provided by radar satellite data providers allowing students to compare images and look for changes / disturbances. 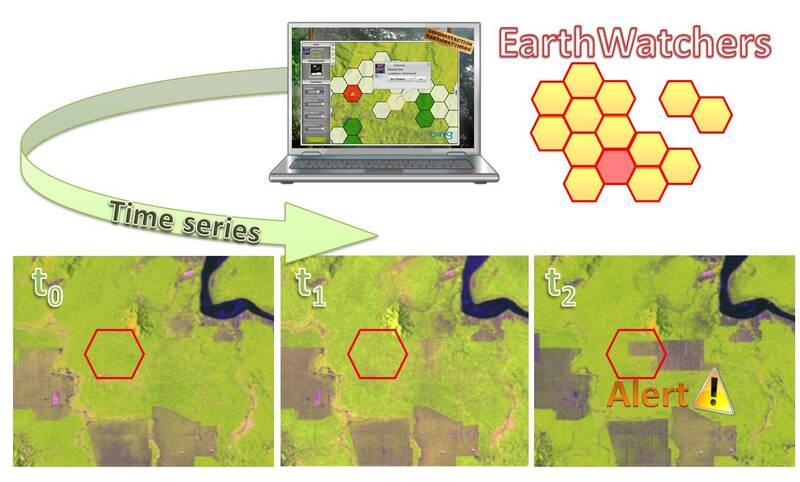 Students can report disturbances from within Earth Watchers and collaborate with their neighbours, who hold the land around their hexagon, to explore whether or not the disturbance is related illegal activity. Intelligence is sent directly back to the data center, and illegal activity is reported an investigated in partnership with local authorities. Make available and accessible different geographic layers of the area for the students to explore and understand the inter-relationship between biotic and abiotic factors in forest conservations (biodiversity layer, forest density, human accessibility and infrastructure, carbon deposits, etc). Protect the forest: by deploying a team in-situ who can confirm/de-confirm the illegal deforestation suggested by the students and engage the local authorities to stop it. 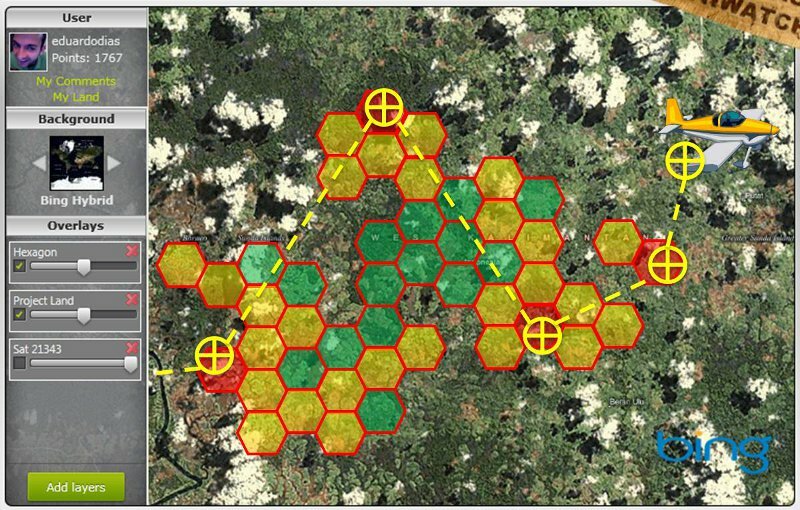 Prove that useful results can be harnessed from radar earth observation analyzed using human computation (in a crowdsourcing effort). Start with a pilot area as a proof of concept in Sintang, West Kalimantan, Indonesia where local executive power support and an in-situ team have been organized. Borneo was, half a century ago, almost entirely covered by tropical forest. But, logging and conversion to oil palm plantations has reduced forest cover dramatically victimizing indigenous fauna and heavily contributing to green-house gases built-up. According to the World Bank (2001), 75% of the timber is harvested illegally in Indonesia. Everyday large areas of forest disappear and we urgently need new to increase awareness and stop the complete depletion of the forest. New solutions that go beyond traditional (political) reports, that are limited to analyzing and reporting the forest changes but fail to prevent it. We propose a new solution that taps into the potential of near real satellite time monitoring using human computation techniques, linked with immediate action on the field in order to halt deforestation. Satellite Earth Observation is playing a crucial role in environmental monitoring, analysis and modeling. In our project, where we want to monitor de deforestation process within the rain-forest dynamics, earth observation plays a pivotal role since it reveals information from areas which are of very difficult physical access and could never be intensely monitored in any other setting. For our area-of-interest, the rain forest in West Kalimantan, Borneo, Indonesia, a special challenge for earth observation is imposed: the area is very prone to cloud coverage which makes much optical satellite data unusable. An alternative is the usage of Synthetic Aperture Radar (SAR) products, which can play a crucial role as their performance is weather independent. But while optical data can easily be understood by untrained users (our target group), especially true for “true color” and “natural color: composites and vegetation indexes, the same ease-of-understanding is not usually a characteristic applied to SAR data, where specific expert knowledge and sophisticated processing techniques are needed to derive useful information. Nevertheless, we propose to use the untrained (and unconditioned) spirit of the children (that is free from academic assumptions) to explore the SAR data and we expect that they will uncover patterns and fine issues that might never be uncovered in automated efforts. At the same time, the children will learn about the background technology and potential of SAR earth observation, multiplying the understanding, market and target base of SAR users for the coming 5 to 10 years. In order to keep our young volunteer users motivated in their task, we have developed a very dynamic system based on social-media network (such as Facebook) and backed-up by ground reports. For each user joining the system an area of 1,6 km2 is allocated, he is responsible to watch that land every time new NRT satellite data becomes available, but he is not alone, he can interact and cooperate with his “neighbors”, the watchers of other 1,6km2 cells around him. When a global user discovers a suspicious activity in their land he will report it in the system (which also gets posted to the social media network), then all his “neighbors” and “social-media friends” get invited to inspect the reported area and confirm/disconfirm the suspicion and discuss it online via a geo-commenting system (so even if a certain patch is never changed, the user can still be fully busy analyzing other patches where phenomena are happening). The ten most confirmed sites will be surveyed every week by our local team on the ground (to be based in Sintang) who will report back their findings into the social network system (with photos, video) of the actual illegal activities or some other natural occurrence (e.g. local flooding). For increased security and safety, the local team will deploy Unmanned Aerial Vehicles (to avoid direct contact with illegal loggers). If illegal activities are proven, the local regional authorities (the local governor and local community chiefs) have confirmed their support to this project and to stopping deforestation and promised to enforce the law based on our geographical advice. While local executive power corruption and inactivity is one of the biggest challenges in the area, this system, by using the eyes of millions, will create a massive awareness of every event including global media attention motivating the stakeholders to act. In addition, upcoming satellite imagery will soon demonstrate, with full transparency, if any action was taken (world eyes watching from above). The acting body (the local forest police office) will receive their directives from their hierarchical superior regional commander (our contact), making it difficult to ignore such alerts. Sign up to be an EarthWatcher! Help us protect Borneo forests!